Investors are optimistic about Russian macroeconomic fundamentals in 2012, even though many analysts anticipate a rough first half of the year. Investors have started 2012 bullish on Russia - the country’s benchmark R.T.S. index was up 10.2 percent by Jan. 23 - but analysts believe that the first half of the year will be difficult as Europe continues to struggle with debt issues. 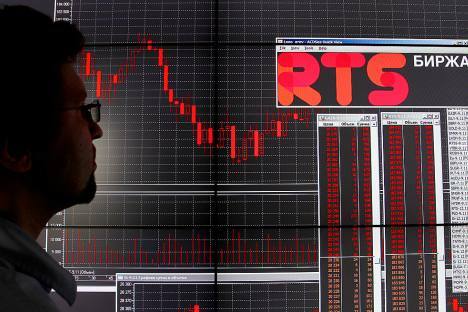 Many Russian brokerages believe that the R.T.S. index will keep within the current range of 1,400–1,500 points until the end of 2012, reported Russian journal Kommersant Dengi in the middle of January, due to an economic slowdown in Europe externally and political turbulence surrounding the March presidential election internally. But the more optimistic observers believe these risks are overstated. Russia’s biggest investment bank, Troika Dialog, which has just been taken over by state-owned retail behemoth Sberbank, surprised Russia-watchers by revising its end-of-year target up to 2,200 in the middle of January, which would mean a whopping 60 percent over the course of the year. Clearly, much depends on how well the rest of Europe deals with its problems. Almost all investment banks working in Russia have the same strategy for 2012: pick solid value stocks in the first half of the year, while investors are still wary of risk. Power company E.On Russia and regional supermarket chain Magnit are two of the most popular names in this category. Tactical defensive stocks are those that pay high dividends, such as oil producer Bashneft, or those in counter-cyclical sectors, like gold producer Polymetal. Then, as the economy starts to recover in the second half of 2012, investors are widely expected to start buying growth stocks, favoring sectors such as real estate, media, commodities and the Internet. Popular companies in this category include C.T.C. Media, gas producer Novatek and search engine company Yandex. Sberbank is universally the top pick for growth among brokers. Despite the slowdown, Russia’s banks put in a record-breaking year for profits in 2011; Sberbank accounted for most of the sector’s loan growth by itself. In general, Russia’s banks are getting on with the job of rebuilding their businesses following the setbacks of the last two years. Russia’s oil pipeline monopolist, Transneft, is also being discussed as a good buy. The company’s investment program is coming to an end, after which it will generate billions of dollars in free cash flow, some of which the management said may be paid out as dividends in an effort to boost its attractiveness ahead of a possible privatization. A.F.I. Development, a leading Russian developer, is another popular name. The office real estate market in Russia has already clawed back most of its pre-bubble gains, and there is a boom in warehouse construction as rents rise on the back of high demand from Western importers hoping to tap Russia’s burgeoning consumer goods sector. Russian equity will also perform well at some point, as equity valuations have rarely been this cheap. Currently the discount on Russian stocks compared to the other members of the BRIC is around 50 percent, according to J.P. Morgan — much cheaper than the usual 25–30 percent discount in normal times. But perhaps the most telling indicator is the oil price implied by the equity valuations: As Russia is heavily dependent on oil exports, the stock market gains and losses tend to move in lock-step with the vagaries of the international price of oil. In the boom years, Russian equities occasionally got ahead of the price of oil, however, the current low index level implies an oil price of $60 — way below the current price of about $100. In other words, Russian stocks have priced in a full-scale crash of the European financial system.